Andrew Weil, MD, renowned physician and pioneer of integrative medicine, is also in the restaurant business. In 2008, he, along with Sam Fox and Michael Stebner, opened the first True Food Kitchen in Phoenix Arizona. Weil says, “The greatest challenge I’ve faced since the 1970s in trying to change American eating habits for the better is the widely held belief that food that tastes good and food that promotes health are in opposition–it’s either/or, but can’t be both/and. 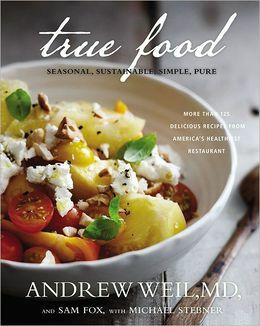 The only way I know to convince people otherwise is to give them the experience of food that is both good and good for you…Now with the restaurants, I can do it much more efficiently…I believe it will help propel a food revolution that’s taking place throughout the country.” In addition to the widely-successful restaurants, Weil has now written a book featuring recipes that are both good and good for you. Filled with beautiful and mouth-watering photographs, there are lots of delicious recipes which are interspersed with some great informative short pieces including Following the Farmer, Sweets and Sweeteners, True Whole Grains and Avoiding Sugar, Fat and Salt Crutches. The book starts with the True Food Pantry, which includes some common and uncommon ingredients that are featured in the book’s recipes. The range goes from San Marzano tomatoes to nutritional yeast flakes to astralagus root to yuzu kosho. The recipes are clearly written and easy to follow. A few highlights: Grilled Sweet Potatoes–Yakitori Style, Summer Vegetable Style and Lemon-Ginger Frozen Yogurt. True Food is a book full of good-food inspiration. Weil, Fox and Stebner’s culinary endeavors are to be applauded–you’ll want to eat this food and read the articles. You’ll feel better all around!